Streets Alive is working in 3 areas of Bristol since the summer and over the winter, talking to and helping residents to talk to and organise with neighbours. Dozens of streets in Brislington, Bishopston and Greater Fishponds/Eastville all find it encouraging to talk about generations and life in streets. Many have planned street parties and pre-xmas get-togethers. What people say is much more positive than what we hear in the media – people do have all sorts of positive relations with neighbours of all ages. See these great real stories about life in streets by Aardman’s. It was coordinated by Bristol Ageing Better. Warm and witty. Enjoy. Good weather brings out the smiles amongst neighbours, so it is time for social get togethers to make Age Friendly Streets. Ask Streets Alive how you could develop the campaign in your area or organisation to reduce isolation, especially of older people. 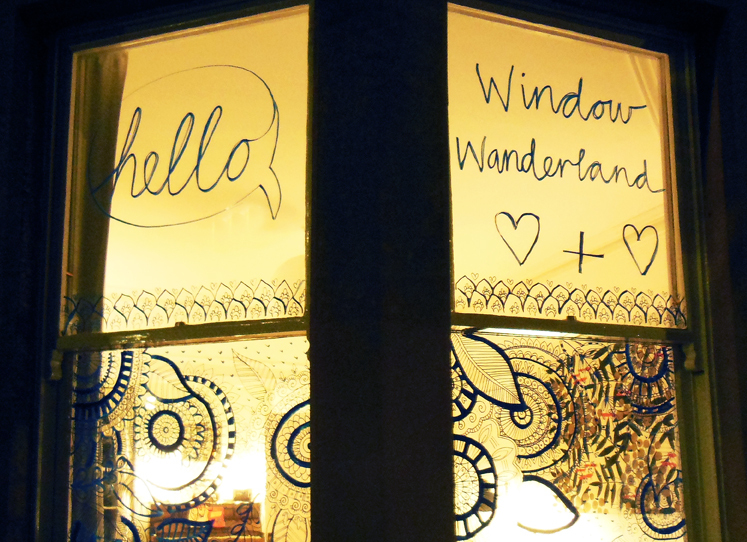 There could be a street meet, swap shop, street quiz or just saying hello and chatting more. Christmas online shopping would be difficult without older neighbours. So many internet shopping parcels get dropped at older neighbours’ houses as they tend to be at home more. This trend of the modern age is one fascinating finding of this Age Friendly Streets campaign. And when the younger online shoppers pick them up it is a great chance for chat between generations, and an invite for a mince pie and a drink. Here is a story of one older resident who is very happy to take in parcels. Christmas and New Year can be jolly for some but isolating for others. Here are some ideas to warm up your Age Friendly Christmas Street. • Hold a Mince Pie get-together – invite some neighbours round for a drink, mulled wine and a mince pie, even at short notice. You could either drop a note round, or just invite some in person. • Offer a drink or cuppa on New Year’s eve or day. • Perhaps suggest holding a street party or a more modest tea party or BBQ street meet next year. More about Age Friendly Streets and Streets Alive. In a month-long experiment, residents in a suburban street in Manchester were asked to keep a diary of how they got on. Five households had strict instructions to smile at people in the street and offer help where they could, and to try to strike up conversations. Although several reported “strange looks” and some initial reserve, by the end of the four weeks all participants reported success. Jay who had lived in the area for 24 years without plucking up the courage to talk to anyone, said “I’ve really seen a difference. People I’ve never met before have been a bit more sociable and said hello on several occasions. The study has been useful and really proven that we are a nice little street with a small community.” Jay is now delighted to be running a bin rota with his new friendly neighbours! “I take in all the parcels of this part of the street” says Thelma, 81 in Horfield, Bristol. Parcels are the new neighbours’ glue as they create a chance for a chat when parcels are handed over. Delivery staff say that more than half of all parcels are left with neighbours who are mainly older people. This is because they are at home more than younger people who are buying things online to be delivered at home when they are out. 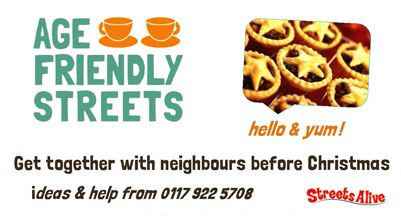 Our campaign for small acts of neighbourliness http://AgeFriendlyStreets.org/ launched by http://www.StreetsAlive.org.uk/ and https://www.Facebook.com/streetsaliveuk starting in Bristol UK. Be the street you want to live, with all ages. It all starts with saying hello and chatting with neighbours.